When it comes to the economy, Donald Trump is the preferred choice of American voters. Voters overwhelmingly think Democrat Hillary Clinton will be the next president (whether they want that or not), but when they are asked specifically who would be the better candidate to "handle the economy," 51% say Trump and only 43% say Clinton, according to the latest CNN/ORC poll released Tuesday morning. Clinton is fighting back to change that impression. In a fiery speech Tuesday, she lashed out at Trump, calling him "reckless" and "dangerous" for the economy. His policies would cause 3.5 million Americans to lose their jobs and send the country into a recession, Clinton said, citing a new research report from Moody's Analytics. "Just like he shouldn't have his finger on the button, he shouldn't have his hands on our economy," Clinton said. Clinton didn't just give a speech. Her campaign also unveiled an entire new website: www.ArtoftheSteal.biz that's teeming with articles, data and videos bashing Trump's record as a businessman. 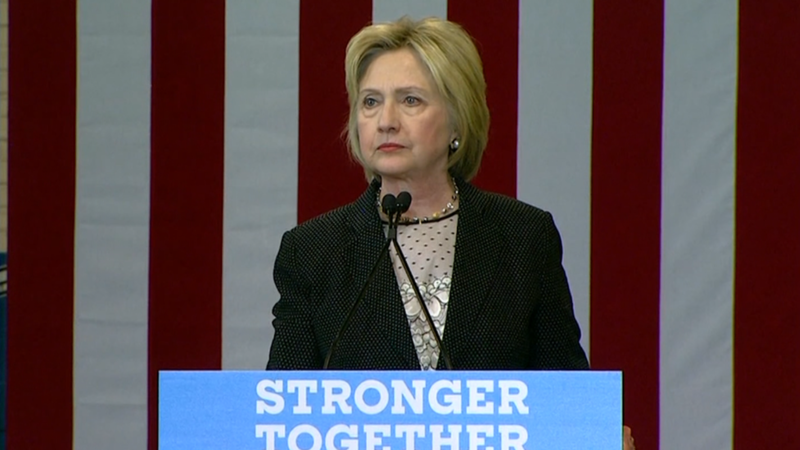 "We can't let him bankrupt our economy like one of his casinos," Clinton said, citing CNNMoney's reporting on how Trump's companies have filed for Chapter 11 bankruptcy more than any other companies in the last 30 years. Time will tell if Clinton's criticism of Trump on the economy has any impact on voters. She took a similar approach recently to attack Trump's foreign policy positions. Polls show the majority of voters trust Clinton more on foreign policy, but she hasn't gained any ground against Trump in recent weeks on the issue. Trump wasted no time Tuesday hurling the insults right back at Clinton. "How can Hillary run the economy when she can't even send emails without putting entire nation at risk?" he tweeted. Trump says he will address the "failed policies and bad judgment" of Clinton in a speech on Wednesday. Trump has been tying Clinton to President Obama's economic record, saying "Obama-Clinton inherited $10T in debt and turned it into nearly $20T" and that food stamp usage has soared under their leadership. He claims their trade policies have cost jobs and that Clinton's immigration plan will cause wages to plummet as cheap labor pours in. Political advisers continue to tell Clinton that she has to offer an inspirational message on the economy. Voters are frustrated that real wages haven't gone up much in about 20 years, at least for the middle and working classes. But voters don't understand what Clinton is offering them. "Her proposals strike me as incremental, not sweeping. She needs to have a more inspiring economic policy," says Greg Valliere, chief strategist at Horizon Investments. CNN global economic analyst Rana Foroohar agrees that the speech didn't get people excited about what the (Hillary) Clinton economy could be. "The sound track was the most inspirational part," Foroohar said on CNN's "Legal View with Ashleigh Banfield." Clinton walked off the stage Tuesday to the tune of 'Fight song" by Rachel Platten. On Wednesday, Clinton says she will "set out ambitious new goals" for the economy, jobs and wages.